Impact! sure does know how to run a successful Kickstarter (and here's how they do it). Well, they're D14/D18 dice campaign has made it to their second stretch goal. 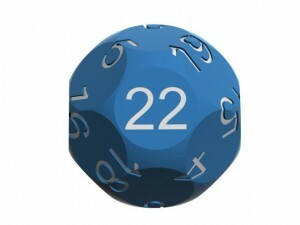 So now they're making a D22. That means you'll be able to have every even-numbered die from 4 to 24. Impact! has reached the Stretch Goal needed for them to also create a D22 as part of their KickStarter to create spherical D14s and D18s in 8 colors. Multiple package options available with the dice starting around $2 each.